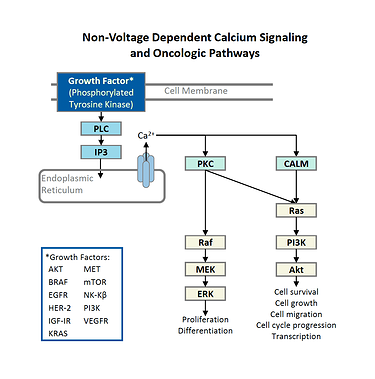 The CTO mechanism is involved in non-voltage dependent calcium signaling, addressing several factors in malignant gliomas. Overcome Drug Resistance: Augments apoptosis through inhibition of tyrosine phosphorylation of BCr-Abl, ERK, and Wnt-β-catenin, offering a plausible mechanism by which CTO circumvents chemoresistance to Temodar® and other drugs. Source: Guo L, et al. Anti-Inflammatory and Analgesic Potency of Carboxyamidotriazole, a Tumorostatic Agent. JPET April 2008 vol. 325 no. 1 10-16; Corrado, et al. arboxyamidotriazole-Orotate Inhibits the Growth of Imatinib-Resistant Chronic Myeloid Leukaemia Cells and Modulates Exosomes-Stimulated Angiogenesis. PLoS One. 2012; 7(8): e42310; Sathornsumetee S, et al. Molecularly Targeted Therapy for Malignant Glioma. Cancer 2007(110) 13-24. 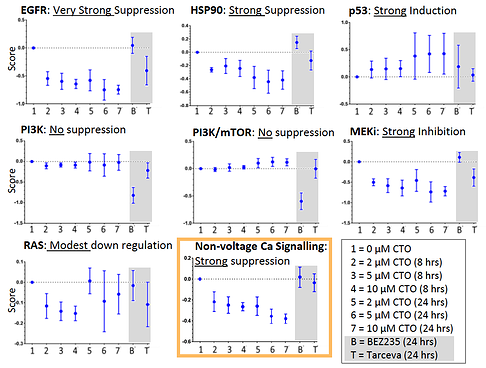 Based on pharmacodynamic markers, CTO has a suggested mechanism of action that inhibits genes associated with non-voltage dependent calcium signaling, which ultimately translates into the inhibition of multiple oncogenic pathways. These results may provide the molecular MOA of CTO’s observed clinical benefit in a broad spectrum of tumors with different genomic types and a tool to design customized combination therapies of CTO with other agents Arm C of the phase I/II study expected to initiate in December 2013 will include pharmacodynamic marker analysis.